This post is sponsored by Carson Market. Even though we have these great things called smart phones that are little computers that travel around in our pockets, its always a good idea to keep important numbers somewhere easily accessible. Not everyone saves local tow companies in their contacts (or do you??) There are times your phone could be dead, you forgot it at home, or you can’t use your data because of where you are (that’s happen to me more than once). Keep your roadside assistance service phone numbers on the list. The claims number for your insurance company or your Agent in case you are involved in an accident, emergency contacts for you and your family in case something happens, so police or paramedics can contact your family. Obviously a cell phone is important and keeping a charger handy will make sure it’s always charged when you need it. Keep it in the glove box for easy access, and it’s easier to plug in your phone while you are driving. 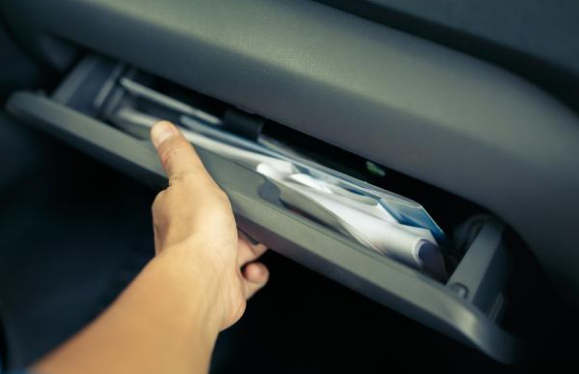 An umbrella in the trunk isn’t going to help you if it’s pouring when you get out of your car – keeping it in the glove box will at least keep your hair from being completely ruined. Again – a full size first aid kit is great to keep in the trunk. But sometimes you need something from it in a hurry. Keep the important stuff that may be needed right away; such as band aids, tissues, pain relievers, etc. Breaking your car window isn’t something someone plans to do – but it’s nice to have if there is an emergency like having an accident and getting into a body of water. Having that tool handy could actually save your life. They say that if your car ends up in water you should quickly roll down your windows and swim to safety, but if you can’t (sometimes water can short out the electric windows) you’ll need to shatter them. It’s a lot easier said than done, so they make tools specifically for this purpose. There are ones that include a blade to cut jammed seat belts, and metal head to break the window. Sure it’s probably not likely – but accidents are just that (accidents) so it’s always a good idea to be prepared. If you don’t have a conceal and carry, go for the next best option – pepper spray. Keep it close enough to get to in case there is an attacker and you can grab it in a hurry. I say have both – as great as GPS’s are, sometimes they don’t work if you are out in the middle of nowhere. A good old fashioned map will at least help get you to a main road, or get ‘un-lost’.